Priced: $23.96 - $34.99 Rated: - 5 stars out of 5 by 13 reviews. Get up, tune in, and rock out with the Skullcandy Uprock Headphones—the latest offering from the headphone gurus that are Skullcandy. This ergonomic and adjustable headphone accommodates to all sizes of domes while the twin 40mm drivers hit hard like an anvil dropping on your cortex. The Uprock is constructed from a blend of lightweight materials that can stand up to adventures of life. The blanket-soft padded ear pillows are comfortable enough to lull you to sleep, assuming you weren't blasting you alt-country/rap/bebop/rock mashup mixes. Includes an extra set of ear pillows to replace the ones your dog will chew up. Bad dog, baaaad! Skullcandy Uprock on-ear headphones with one button mic/remote. Skullcandy's Uprock musical burn unit brags twin 40mm drivers, tangle-proof flat cables and a mixed-material composition sturdy enough to deal your beats and withstand opposing jerks, drops and hustle without breaking. Don't mistake the ergonomic design, soft-touch finish, and plush ear pillows for weakness – this headphone thrives on around-the-clock rocking. True to its urban dance-based namesake, Uprock is the ideal tool of engagement for synchronizing music with your daily routine. Imported. The Skullcandy Uprock Headphones are versatile and easy to use, featuring a tangle-free flat cable, loud 40mm drivers for full spectrum sound as well as a lightweight ergonomic fit to keep your ears comfortable. These no-nonsense accessories were built for the true audiophile, utilizing gold plated connections, ferrite magnets and a punchy 20-20 kHz response to give you crystal clear sound time after time. The SkullCandy Uprock has a sleek design that turns heads while remaining comfy on your own. The Uprock delivers an advanced audio experience that easily burns the competition. Skullcandy's Uprock is the newest and freshest addition to the arsenal of headphone NEEDS. This is not a wish or want kind of situation; these headphones will turn off the rest off the rest of the world and let you get it done the way you need to- by rocking your face off. Sporting twin 40mm ear exciters, tangle-free flat cable, and a mixed material finish for extra machismo, the Skullcandy Uprock Headphones boasts the street cred of a Brooklyn street gang and is synchronized to the beats and rhythms of roots, rock and hip hop. Keep it minimalistically simple with the Skullcandy Uprock Headphones. Their 40 mm drivers ensure that you get supreme sound no matter where you are. You won’t even be able to hear the waaammpp waaammpp waaammmpp of the adults around you. With the perfect blend of style, comfort, and performance, the Uprock headphones from Skullcandy® will keep you in style and up to par. Sporting twin 40mm ear exciters, tangle-free flat cable, and a mixed material finish for extra machismo, the Skullcandy Uprock boosts the street cred of any street gang. Twin 40mm drivers crank full spectrum sound. I was really surprised by these headphones. I was able to give them a test run when my niece bought a pair and the sound was far better than the price would suggest. I especially like these headphones for listening to vinyl, because they reduce a lot of the treble that comes to listening to records; they are perfect for jazz. It does help to use these with headphones with a device that has an EQ, like a home stereo or computer. I didn't think the sound was very good when I used them with my iPod shuffle, because the overall output sounded about 20,000 leagues under the sea. With that said, this is more of a problem with the shuffle, since the shuffle settings are not very bright with most headphones. I wanted a pair of these, because I use headphones a lot and ear buds tend to become uncomfortable after long periods of time. These headphones should fit just about any size head; I have a big head and they were fine. This is my second pair of Uprock headphones. I lost the first pair to a freak vacuum cleaner accident. I'll try to be more careful with this pair. The sound quality isn't great, they're a little boomy, and there's not great response on the high end. But, they're inexpensive, so I didn't have high expectations anyway. The build quality is fine. There some uneven seams where plastic pieces come together, but nothing bad enough to make me get out an Exacto knife to trim away excess material. I wish the L and R on the inside of the headband were more visible--I solved the problem with a black ballpoint pen. The flat cable is nice, but could be a bit longer. Overall, it's a good purchase for not much money. I'll buy 'em again when I lose these to another inevitable vacuum cleaner accident. I purchased the orange and purple Uprock headphones this past Christmas (2013) for my nieces. Those little girls love these things and simply can't live without them! 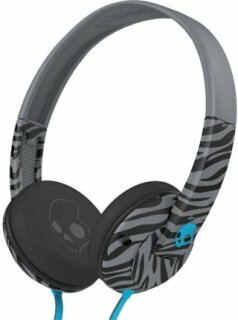 I think the skull candy headphones are percfect for the pre-teenagers because they have great sound and are very inexpensive! Thank you Zappos and skull candy, my nieces are very happy with their headphones! Decent headphones at a great price! Good sound and very comfortable. I wear them at work and can have them on for hours without them hurting my ears. I wouldn't recommend them for running or heavy activity though. I only use them for the office but I haven't had to listed to any stories of my coworkers disappointment in their children since the purchase. I got two pairs of these for my kids and they put them through the wringer. Great colors to choose from and great quality. Basically just what I was looking for in headphones.. simple and good looking. Great price and sound, no complaints here! These things are extremely good for their price. They are durable and have great sound quality. Very comfortable too. Such a sick pair of headphone. Ultimate sound for cheap. I bought them for work. Sometimes I feel like it has too much bass for my taste. I like the flat cord but not too much fond of having a cord on each side, though it's pads are very comfortable and seem durable. Do I recommend it? Yes it fits my current needs for a very low price. It's good for Skype calls and helps you to block some of the surrounding noise but, don't expect a superb sound quality. Durability-not sick- they do not flex, and after wearing them skiing for a day they skip sections of what I'm listening to. Over all they are great wear around headphones, but not for skiers or boarders.